Add sweet Luck to your Spring dishes! 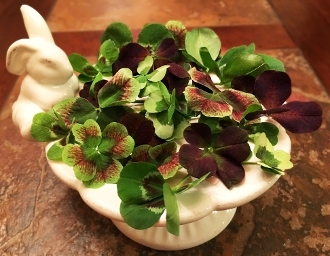 Gorgeous three, four, and five leafed lucky clovers! Patterns of bright green, white and rich purple. Mild, earthy taste. Unique decoration for cocktails and cheese plates. Add to salads, top any meat entrée or use as an edible bed for appetizers. Perfect garnish for St. Patty's Day!